On a February day in 2008, Forrest Church sent a letter to the members of his congregation, informing them that he had terminal cancer; his life would now be measured in months, not years. 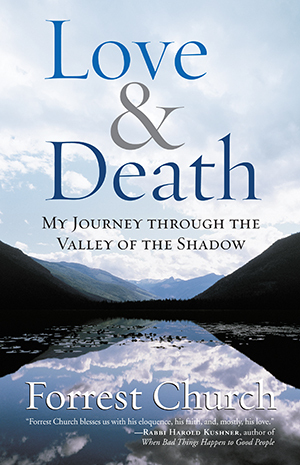 In that remarkable letter, he wrote: “In more than one respect, I feel very lucky.” He went on to promise that he would sum up his thoughts on the topics that had been so pervasive in his work-love and death-in a final book. "[A] courageous and wise work." "As pastor of New York's All Souls Unitarian Church, Church is perhaps most comfortable speaking in sermons, which may also be especially comforting, now that he has received a veritable death sentence via terminal cancer, to his congregants and the readers of his many books . . . Church speaks directly to the heart with a message of certain solace to virtually anyone facing the loss of a loved one." "[H]e is certain of the love of Christ that endures beyond our own lives, and he criticizes fundamentalisms of both the right and the left. This book rewards the reader with many wise and quotable thoughts. 'The purpose of life is to live in such a way that our lives will prove worth dying for,' he says. His life's mantra has been 'Do what you can, want what you have, and be who you are.'"